Set the GUI to load manually. The core engine (processgovernor.exe), running in the background, will apply all algorithms and automation. You can then open the GUI when you need to check the status or reconfigure Process Lasso. Note that when the GUI is not running, the system tray icon is also absent. Disable process icons. The nice little icons shown beside process names must be retrieved from disk and use virtual memory. Therefore, you can improve performance (and sometimes even complications) by disabling process icons via the View Menu of the GUI. Disable or limit logging. 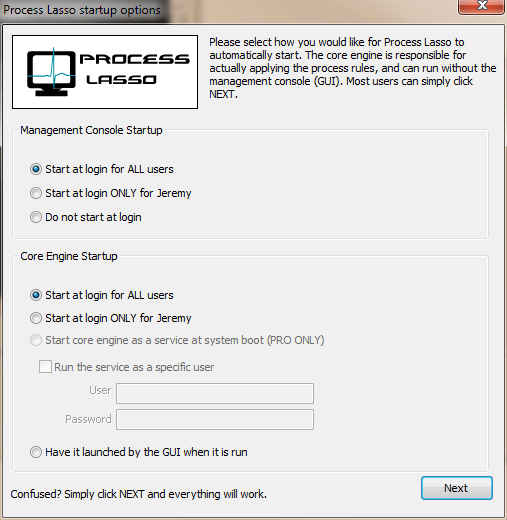 Process Lasso’s core engine will do a lot of logging by default. This includes process creation and termination. On high-activity systems, you may want to disable certain log event types, or the entire log.